Now it’s no secret that foundation sponges have been around for ages. They come in all different shapes and sizes. The most traditional ones that you’ll find are the mini ones that slightly resemble a door wedge. But ever since the various foundation brushes have arrived in our makeup boxes ranging from buffing brushes to stippling brushes it is not a shock that the foundation sponge has gone out of trend. But, thanks to Real Techniques, the sponge is back and it’s better than ever. The foundation sponge had previously been revived by other makeup brush creators, however, after a week, or the most a month of popularity, it soon went back out of fashion. I personally think the Real Techniques Miracle Complexion Sponge is here to stay. The sponge itself comes in a peachy orange colour, so you’ll always be able to find it at the bottom of your makeup drawer. 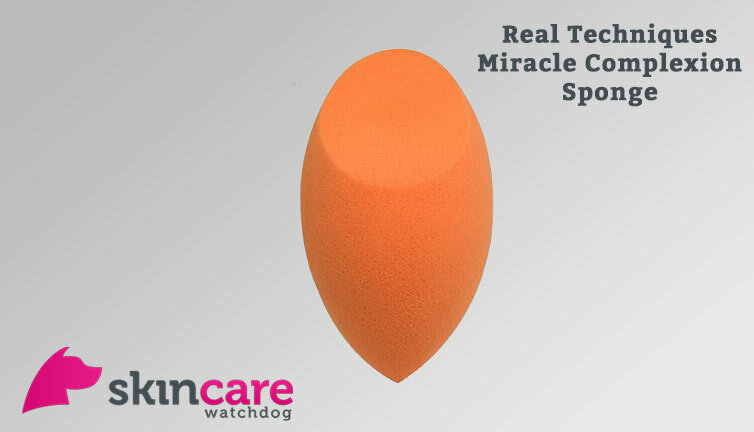 It is basically shaped like an egg like previous revived makeup sponges, however, the crucial difference with this sponge is that it has a flat section near the bottom. Making the sponge have flat sections, pointed sections and rounded sections makes the sponge very versatile and ensures that it fits into every nuck and cranny on your face. You can use this product wet or dry. It all depends on the type of finish that you want. Using it dry will give more of a matte effect, whereas using it wet will give a dewier look. So, first off, decide which look you want to go for, if you go for dewy, when you wet the sponge make sure it’s not soaking wet. The sponge only needs to be damp to allow it to expand and take the water on. Apply, dots of your foundation onto your face e.g. one dot on your forehead, one on each cheek etc. Then stipple (stipple just means dab) the sponge over the product working it into the rest of the skin. Use the tip of the sponge to work over blemishes and the flat edge to work around complicated areas such as the eyes and nose. The Miracle Sponge really is a miracle. Whether you go for a matte finish or a dewy look the sponge ensures that the foundation blends in seamlessly. Therefore, this little piece of equipment is the one that’s going to give you the most natural finish. Because it is a sponge it doesn’t leave the sculpted look that a brush does it lets your real skin shine through, but gives you a nice cover. Also, because it is a sponge, you avoid any lines that you can often get when using a traditional foundation brush.